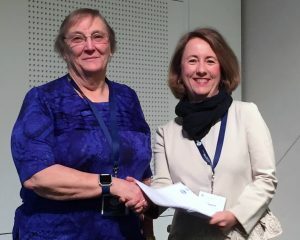 Dr Margaret Kyrkou MBBS FRACGP PhD OAM was awarded the Bob Davis Award in 2016 for substantial contributions to the healthcare of people with intellectual disabilities. Margaret has dedicated her professional life to teaching, research, advocacy and providing specialised clinical care to people with intellectual and developmental disabilities. Margaret’s research in the use of intranasal midazolam in prolonged seizures and in menstruation and puberty in young women with Down Syndrome has led to significant changes in clinical practice. She has delivered clinical services to rural South Australia, managed programs that provided support to students with significant disabilities within educational settings, developed standardised seizure management protocols through the use of intranasal midazolam and for the past 10 years worked in the Centre for Disability Health providing care to children and young adults with the most complex health needs and challenging behaviour not able to be managed elsewhere. Margaret’s expertise in health care of children and adults with ID has led to teaching and other professional roles in Australia and internationally. For 20 years she has lectured at Flinders University, South Australia and has held an adjunct professorial post at Simon Fraser University Canada. Margaret has held many professional roles, participated in numerous committees as both parent and professional and delivered national and international conference presentations. Margaret is an extremely worthy winner of the 2016 Bob Davis Award for substantial contributions to healthcare of people with intellectual disability in Australia.